Priority same day dispatch $60 with tracking and email update service. We suggest with this purchase you tell us what days you will most likely be home or ship it to an address a person will be at to receive it between 9 am and 5 pm. This item is not available for purchase from NT or NZ customers. 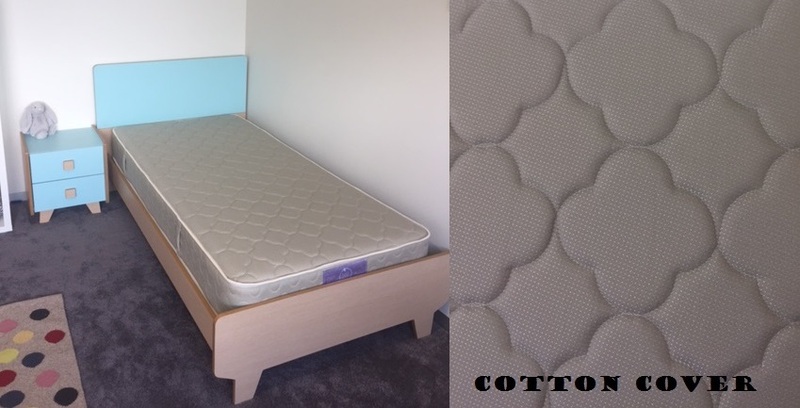 The cotton covered mattress has the same inner as in build and springs however has no lambs wool and an a none organic cotton cover which has a tiny bit of polyester for the warmth and to encourage the baby to sleep in the safe position of on his or her back. The organic cotton covered one has organic cotton fabric with a layer of lambs wool which Tizzie believes makes babies warmer and encourages them to sleep on their backs both mattresses are double sided. Firm - recommended for 2 & a half years to adulthood. (This mattress is firm and passes the SIDS and KIDS safe had test). Medium - recommended for 4 years to adulthood. Soft - recommended for 6 years to adulthood. ****Please note you may not return this item so please be sure of the size of your bed before you order it. ****Please note this mattress is not designed for Trundle Beds so it might not fit. Please check the maximum height before you purchase it. Delivery Locations - We deliver across Australia, however when delivering mattresses we are unable to deliver to PO Boxes, Parcel Lockers or Post Offices. When ordering your Mattress please keep this in mind. Your mattress order will be delivered with Star Track and you will need to be home to sign for the delivery. Alternately please supply a business address. Be one of the first to review the Save Our Sleep Single and King Single Mattress (Organic or Cotton cover)*.